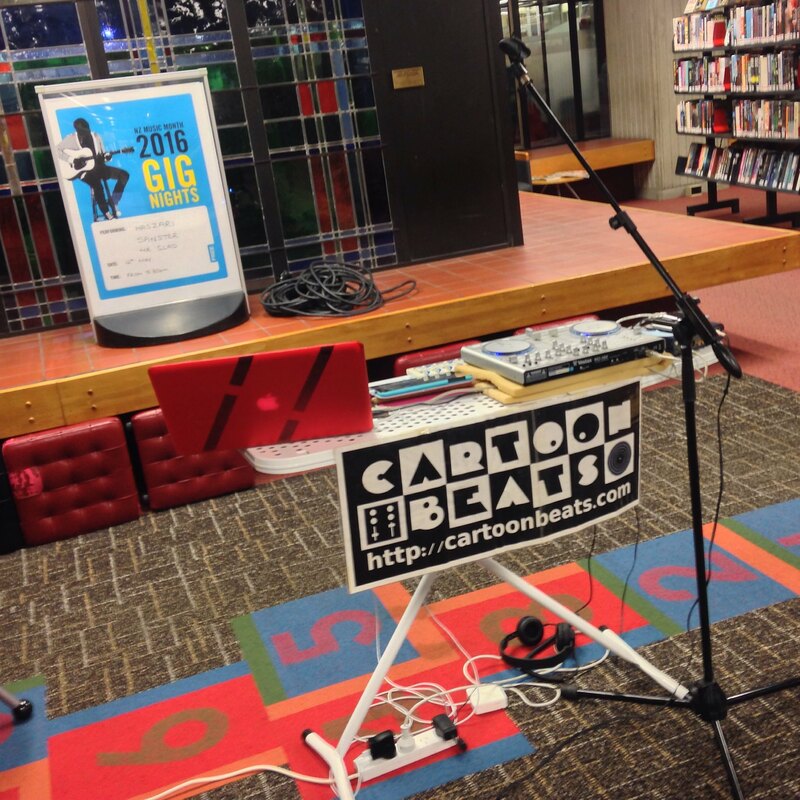 As part of NZ Music Month I was invited to play in the Dunedin Public Library. Because I love libraries, and this one (a marvellous concrete construction) in particular, I jumped at the chance! And of course I'm generally obsessed with the idea of playing electronic music live. Cue a month or so of fervent anxious work getting a set together. Because this was a 20 minute slot, I felt that I could pull out all the stops and make this as complicated as I wanted. Over the last wee while I've been making lots of little loops so I had a bunch of material to play with. The first time through (I had two slots booked - a Sunday morning and a Thursday after work), I had a technical problem, and had to play a (boring old, not even live mate) DJ set instead. In the intervening time I dusted off a custom nodejs websockets OSC UI thing to replace the bits that didn't work (studiomux providing OSC-over-lightning cable). This worked great, turning the iPad into a wireless pattern-trigger controller. On the laptop I used SuperCollider as a MIDI pattern sequencer and also to play back texture samples. This all fed into Logic Pro X where the synthesis, effects and mix happened (with lots of params assigned to hardware knobs). This year I signed up for another 48 Hour film with my workmates (team Arrested Developers). I've been involved a few times now and this year I'm really proud of what we achieved - the film really hangs together well, and is a good match for the genre we were assigned - romantic comedy. Every year going into the 48 hour weekend I secretly dread it. I'm keen to use the process to try and get quicker at writing & producing, and get a bit of practice scoring films, but I'm usually concerned that I'll end up on Sunday tired with nothing amazing to show for it. This year it worked out wonderfully! The team was really well organised, and produced a simple, filmable script with lots of scope for an interesting score. In fact, there's very little dialogue in middle section of the film. I spent a little time on Friday night with the script writers, and awoke on Saturday to a charming (and coherent!) script. I procrastinated over the course of the day, playing around with chords I thought might help me write themes for each character. In the evening, I headed up to HQ (work) and got straight into scoring. There was a near-final rough cut for me to score to (again, fantastic organisation this year!). I wrote scene cues until about 3am, then headed home. On Sunday I spent all afternoon writing & polishing. Sadly, we didn't make the final! I wrote two chord progressions, one for each character. The male lead's was a dubby, cheerful loop while the female lead's was more wistful. I used these chords throughout, using a reggae arrangement for the male theme, and strings for the female. For the "action" sections I made a little moogy arpeggio section. It was a lot of fun hitting cue points in the SMS section, and scoring the denouement. Last year I was involved, to a lesser extent, with Arrested Developers. Aidan wrote an incredible, suspenseful score (I contributed a little loop and some drum recordings). In 2012 I joined team Radial Head. I had a lot of fun, but the score is pretty thrown together, as is the script. The movie looks and sounds pretty fantastic though. Still really like way it starts off with the helicopter shot + darkstep soundtrack. I guess "found footage" is a tough genre! Threw down this mix of recent and not-so-recent tracks the other day. It gets a bit progressive and also sci-fi spacey, so the title is a nod to the classic and/or cliched "disk jockey taking you on a journey" trope. Of course the galaxy destination name came from wurd.